What is chametz? Chametz is defined as leaven, any product in which wheat, oat, barley, spelt or rye has come in contact with water for 18 minutes or longer. To be considered chametz, the food must be edible (defined as something that a dog would eat). To eliminate chametz, it is necessary to rid one's home, office and even one's car (any personal place where chametz may have been brought). It is especially important to be particularly thorough when cleaning the kitchen and dining room areas, where food is generally found. 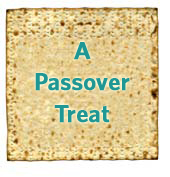 All food items that are actually chametz must be consumed, given away, thrown out or otherwise removed before Passover. Chametz may also be sold through a rabbi to a non-Jew. For more details, please consult your local rabbi. Please note that this is a very brief overview. For more detailed information on Passover preparations, including the search for and burning of chametz, please visit NJOP's Passover Preparations page. *Certain items, depending on the material, may be kashered or may not need to be covered.